Just think—what is pumpkin, but a combination of excrutiatingly delicious orange pumpkin matter, and water. Water is water. It’s great. Stuff of life, 90% of the body, et cetera, et cetera. But it isn’t where the deliciousness lives. In fact, it mingles with the deliciousness of pumpkin flesh and—waters it down. Who wants something that is watered down? No—one seeks the emphatic, the bold, the pure. Right? So the trick to making delicious pumpkin and other winter squash is to remove the water. How to do that. Let’s see…there’s this thing that water does…I know, don’t tell me…it requires heat, but not center-of-the-sun heat…just normal, household-appliance-level heat…starts with ‘e’, ends with ‘e’…yes! It evaporates. Water evaporates when applied heat. Pumpkin flesh, on the other hand, does not. Therein lies the secret. You’re welcome. Water just ups and leaves when things get hot enough. Pumpkin stays for the long haul. Here’s what I’m trying to say. Imagine you roast a pumpkin (or other winter squash) so the flesh is easy to scoop off the peel. Then, you cook the pumpkin flesh in a pan for a good long time, stirring, stirring; till the steam rises and keeps rising and rising and eventually most of the water becomes the steam and leaves; and what you are left with is an increasingly pasty, gummy, reduced, deeply orange mass. This takes only a couple ingredients to become one of India’s famed concoctions, to be had as dessert, or as a side with roti, or snuck in between meals from the fridge. Midnight snack? You wouldn’t dare? Done. Pumpkin halwa is great in all these ways. Halwa is a general name for Indian desserts that are pastes. Sorry. What that description lacks in glamour it makes up in accuracy. It can be made of a number of widely disparate foods; wheat farina, whole wheat flour, carrot; and pumpkin. When I say ‘pumpkin’ of course I’m using it as a term of endearment for all winter squashes, those with the hard shell and sweet orange flesh. I used kabocha, which is known by foodies to out-pumpkin even the standard autumn pumpkins in terms of taste. Made sweeter, it is a nice finish to a meal, served in tiny confection bowls; made a little less sweet, goes great as a side with deep-fried puffed breads, i.e. pooris. Preheat the oven to 425ºF. Slice the kabocha/pumpkin through the equator and scoop out the seeds with a sharp-sided spoon. I have found it really helps to pick a spoon that matches the curve of the hollow where the seeds are. Lay the halves cut side down on a foil-lined cookie sheet along with 2 tablespoons water. Bake in oven for 45 minutes. At that point the squash should be completely soft and easy to prick through with a knife. Bring them out and scoop out all the flesh. 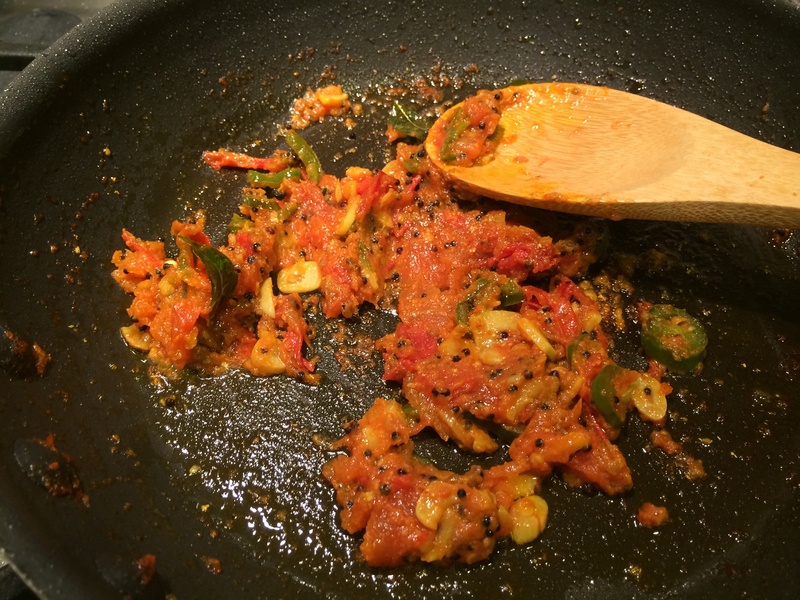 Heat the ghee or butter in a non-stick, thick-bottomed pan. When melted, add the squash and cook on medium-high, mashing it down into the fat and stirring occasionally. Meanwhile, grind the black inner seeds of the cardamom in a mortar and pestle. In about 30 to 45 minutes, the flesh should be much drier and also look smoother, as the rough grain disappears with the water content. At this point, add a pinch of salt, the sugar, and the cardamom. Add more sugar after tasting if it is not sweet enough. Garnish with ground pistachios, slivered almonds, roasted cashews, raisins or any combination. You often see shishito peppers for sale in those little plastic boxes in grocery stores; they look so tempting, but it is often a struggle to know what to do with them. They are not hot at all, and take very well to grilling.The idea is that you pop the whole thing in your mouth and pull out the stem. I have tried that method, and they were good, but not very versatile, being mostly suited as finger food or appetizer. What does one do with them when one isn’t having a party with a platter full of appetizers? Well this simple recipe did the trick. It can go with any Indian meal, be a filling in a sandwich, be the vegetable side for a heartily seasoned piece of fish, etc. 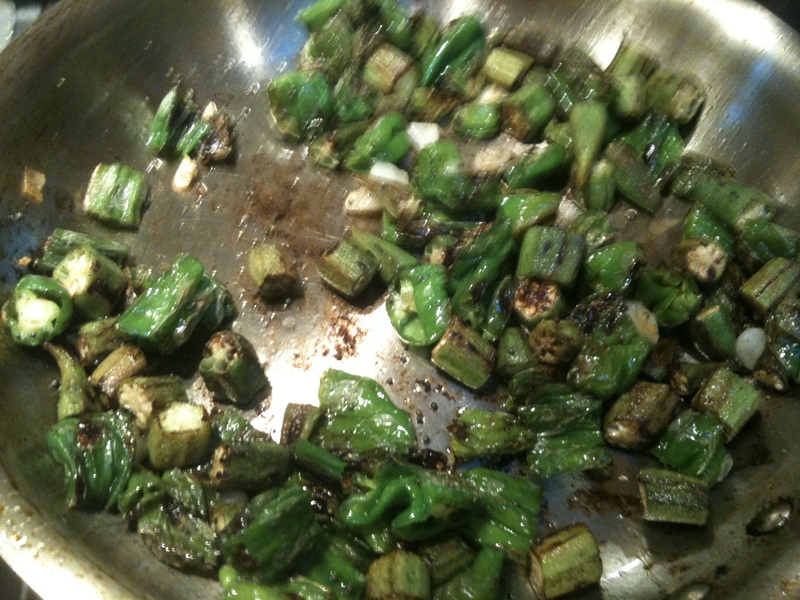 I also got to use up the leftover okra in the fridge; and far from being filler, it went very well with the at once dark and bright flavor of the shishitos. 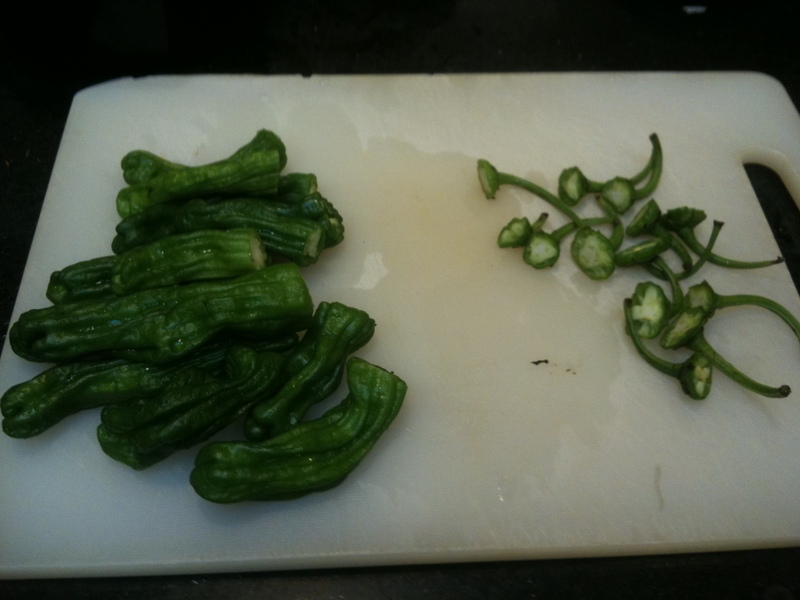 In fact, I might have discovered a soul bond between these two vegetables. Step 1: Wash, prepare and slice the vegetables. 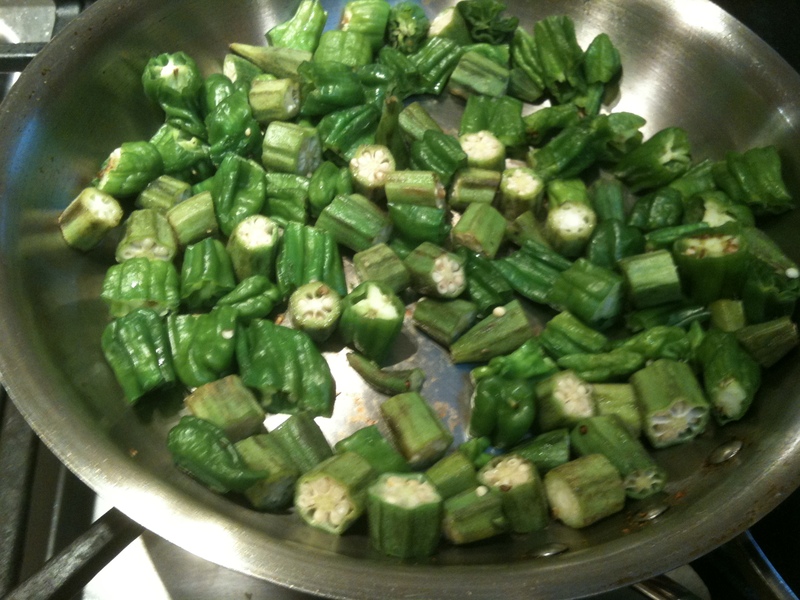 I used one pint box of the peppers and about the same amount of okra. 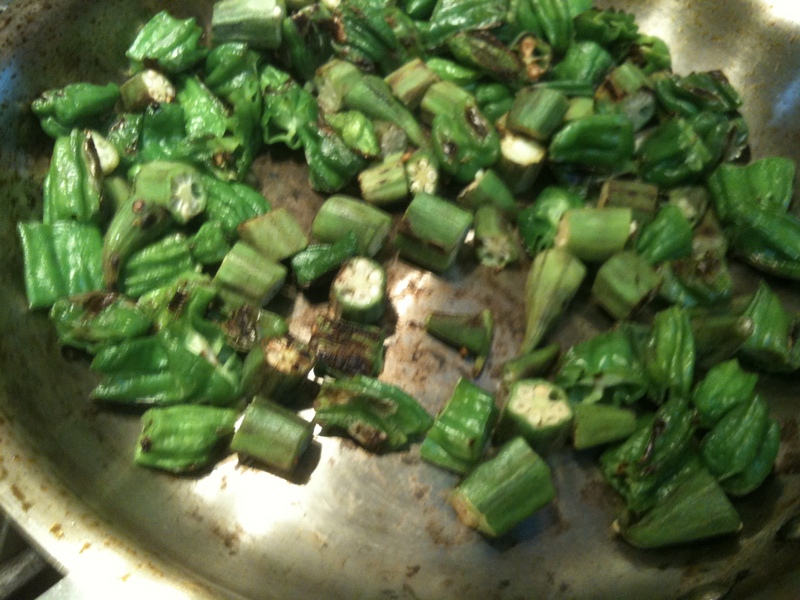 Rinse and air dry the vegetables; take the stem tops off. Then, slice them into even-sized slices about half an inch wide. Now comes the oil. I use pure olive oil for these high heat methods, because the smoke-point of extra virgin is quite low and would work better with a gentle simmering. Clear a spot in the pan, put in the oil, watch it shimmer instantly (because the pan is hot); then stir in the vegetables, thus giving them their first true saute. Now add salt to taste and keep the contents of the pan moving every minute or so. 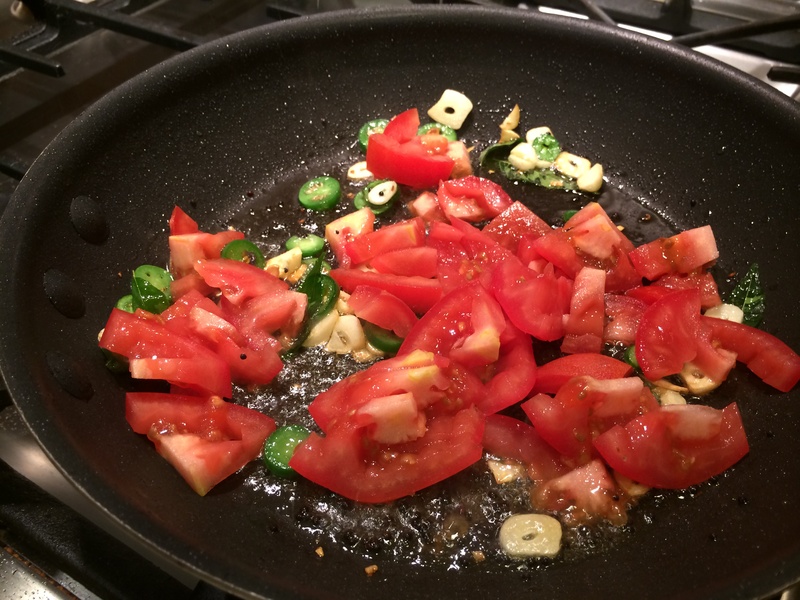 The saute process lasts about five minutes. 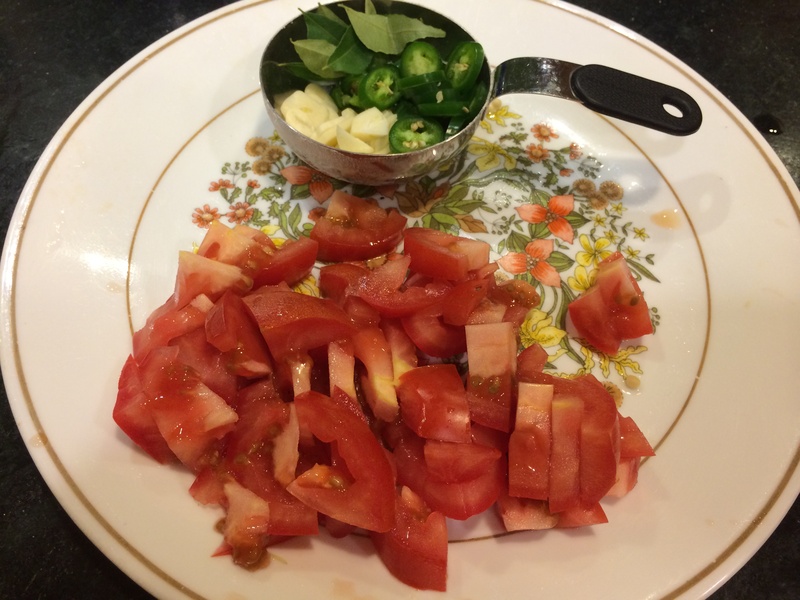 I chose a simple, simple seasoning method for this recipe, that hardly betrays its Indian origins. 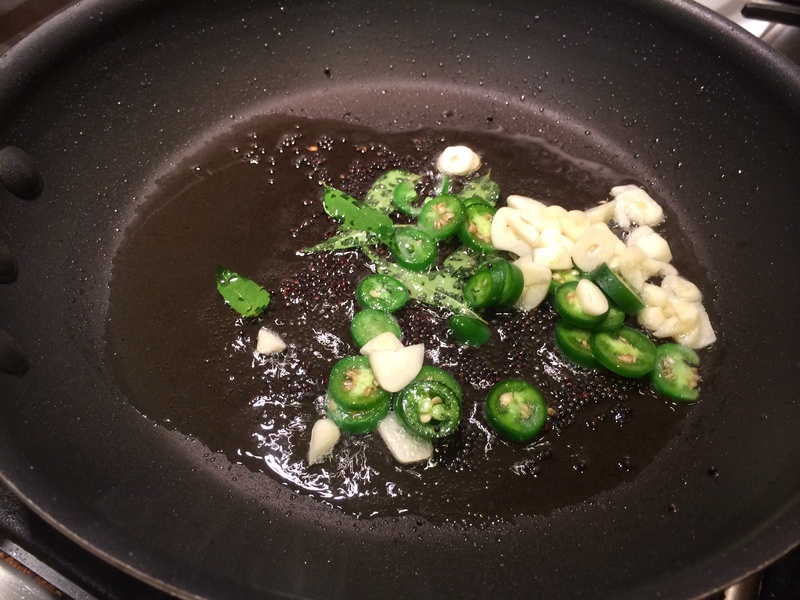 Use two kinds of heat — a healthy amount of black pepper, and some red chili powder. Either could be skipped. 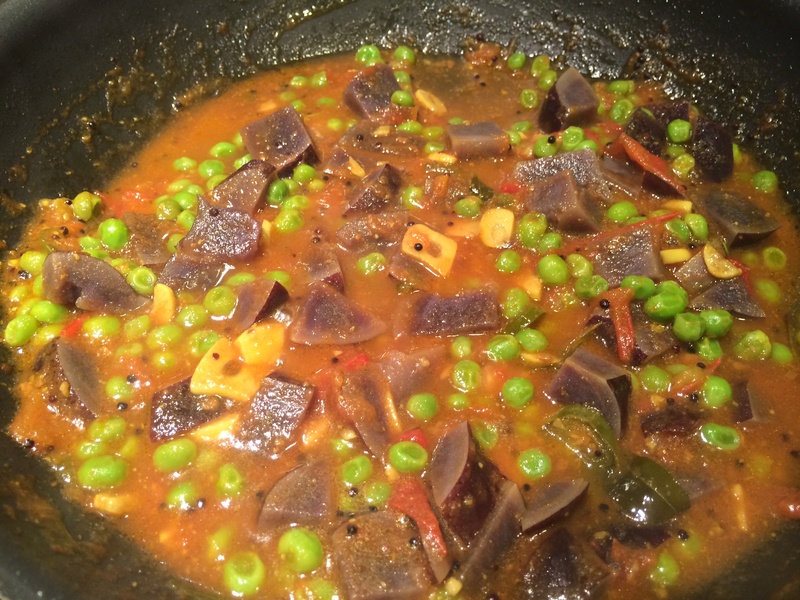 I also added a teaspoon of dry mango powder (aamchoor). Most pantries don’t have this, so some squirts of lime juice would work too. Stir for half a minute, while still on a hot pan; then turn off. We had it with rotis, but it could go with rice and dal, be fabulous in a raita once the vegetables have cooled; or insert them between two slices of focaccia with some avocado, lettuce and cheese.